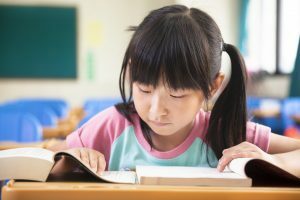 Year after year, The National Center for Education Statistics publishes reports that indicate California students are reading far below the national average. As far as we’re concerned, that’s an absolute tragedy. After all, reading comprehension is vital skill not just in the classroom, but in everyday life. That’s why we’re so passionate about equipping students to become strategic readers. The kind that observe structure and organization within text. The kind that think about the ideas being conveyed, read between the lines, and make connections to related texts or knowledge gained elsewhere. The kind that stop when they don’t understand something and purpose to gain understanding before moving on. We teach students reading comprehension strategies to be used before, during and after reading so that they become purposeful readers. To become independent learners. And understand text at a deeper level. Want to see your child read strategically? Let’s talk about how we can help.